Guachimontones is the name of a ceremonial center and an ancient pre-Hispanic settlement, located in the municipality of Teuchitlán, in the state of Jalisco, west of Guadalajara. Guadalajara is the capital of the state of Jalisco in Mexico. It is located 540 km west-northwest of the capital city of Mexico City. 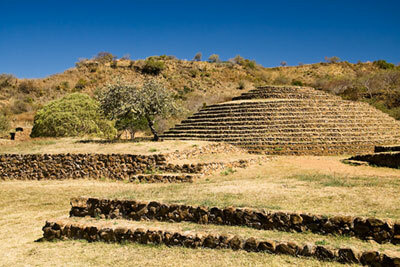 It is located in the Atemajac valley, 1561 m above sea level, near Lake Chapala. The metropolitan area of Guadalajara, with its municipalities Zapopan, Tlaquepaque, Tonalá, Tlajomulco de Zúñiga, Zapotlanejo and Ixtlahuacán del Río, forms an agglomeration of more than 4,242,374 Inhabitants. 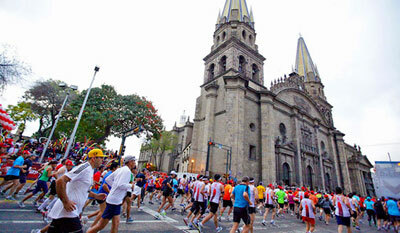 With 814 km2 it is the city of Mexico which occupies the largest area, and it is the second by the number of inhabitants. It is the economic and cultural center of western Mexico. It is also a very touristy city thanks in particular to its colonial architecture.